Few predicted that interest rates would fall in 2014. In fact, most of the talking heads on financial television warned that interest rates would surge, as the Federal Reserve moves to reverse a period of extraordinarily accommodative monetary policy. 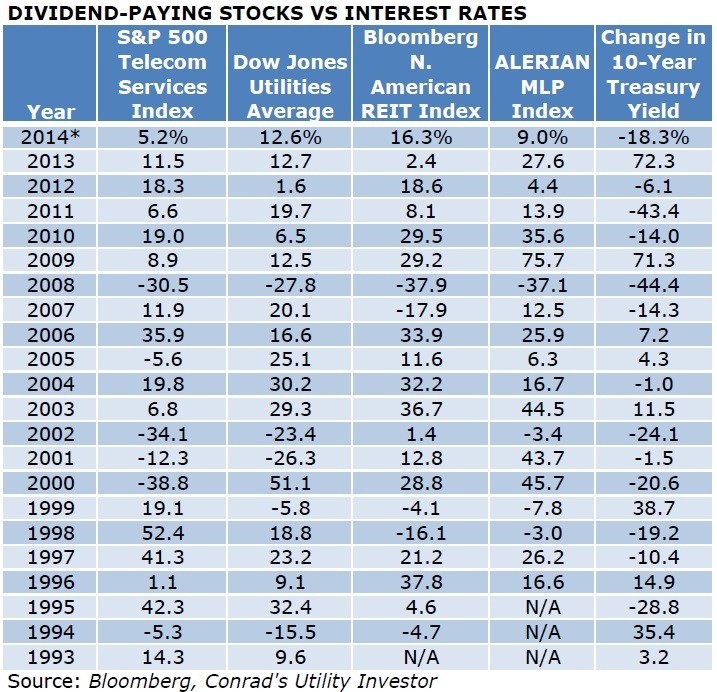 Endorsements of dividend-paying stocks were equally scarce. Rather, most investors and analysts subscribed to the age-old misconception that income-oriented equities are bond substitutes that should be sold when interest rates rise. In the January 2014 issue of Conrad’s Utility Investor, I warned readers not to fall prey to this mob mentality. Investors who heeded this call and ignored the conventional wisdom were rewarded with solid returns from dividend-paying telecoms, utilities, real estate investment trusts (REIT) and master limited partnerships (MLP). 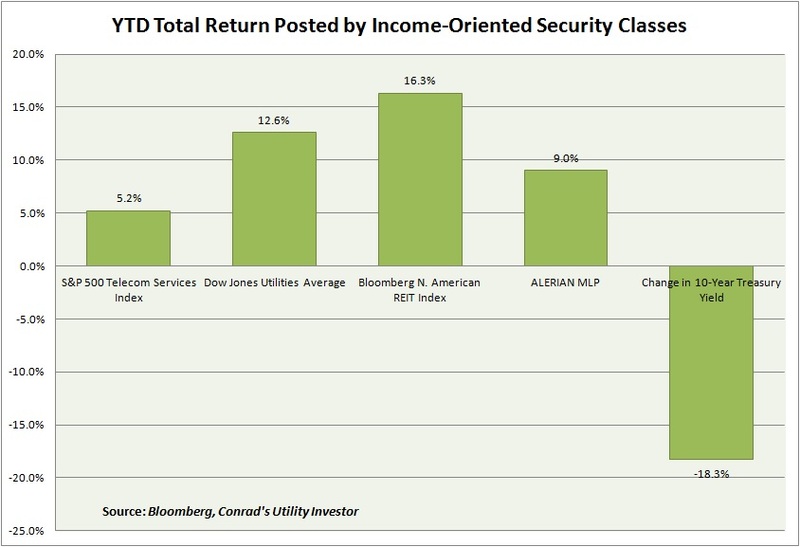 Some of the top performers in these security classes have been unloved high yielders. For example, Exelon Corp (NYSE: EXC) has generated a total return of 37 percent in 2014, despite starting the year with zero buy ratings from the 22 research analysts that cover the stock. We added Exelon to our Aggressive Income Portfolio on July 31, 2013, betting that the utility’s recent dividend cut would better position the company for growth and help to lay the foundation for a turnaround. Check out my free Video Report on Exelon’s prospects after its acquisition of Pepco Holdings. Unfortunately, more than a few investors will get sucked in by the equally dangerous misconception that any bond or dividend-paying stock is a buy because the yield on the 10-year Treasury note has pulled back by more than 18 percent this year. Corporate bonds remain a seller’s market, where even weak credits enjoy historically low interest rates. Municipal bonds have also rallied, despite some high-profile defaults. Dividend stocks have posted solid gains this year. But before you attribute this strength to the decline in interest rates, check out this table comparing changes in interest rates to total returns posted by income-oriented security classes. First, look at the row for 2008. Although the yield on the 10-year Treasury note fell by almost half that year, the credit crunch and Great Recession meant that every security class in our table posted a loss. Meanwhile, these indexes posted strong returns in 2009 and 2013, the two years that involved the sharpest increases in the benchmark interest rate over the past two decades. In other words, dividend-paying stocks tend to track the growth of their underlying businesses, which hinges in part on the economy. Accordingly, these security classes exhibit more of a correlation to the overall stock market than to movements in interest rates. And unlike the fixed coupons paid by bonds, the dividends that companies pay to their shareholders can increase over time. Buying the stock when it trades at a favorable valuation. Even five years into the current bull market, savvy investors can find undervalued names that the market has misunderstood. Unloved rural telecoms have been a boon for savvy investors this year; for example, our Aggressive Income Portfolio holding Consolidated Communications (NSDQ: CNSL) has returned almost 25 percent this year. The overwhelming consensus calls for Windstream Holdings (NSDQ: WIN) and Frontier Communications Corp (NSDQ: FTR) to cut their dividends over the next 12 to 18 months, prompting lots of dumb money to pile on the short interest. Thus far, the insiders that have bought these stocks voraciously have outperformed the short sellers dramatically. Nevertheless, short interest in Windstream Holdings equals 8.5 days of average trading volume and 13.4 percent of shares in circulation. Bets against Frontier Communications represent 15.3 days of average trading volume and almost 16.2 percent of its float. Most investors assume short sellers know more than they do. But short interest only reaches these elevated levels when less savvy investors pile into the trade. And at these levels, the smart money oftentimes has already moved on to other targets. When short interest becomes this elevated, those betting against the stock become vulnerable to a short squeeze. This phenomenon occurs when good news sends the stock higher, prompting the shorts to cover their positions en masse. This wave of buying drives the stock price higher still, creating a windfall for long investors. Both Windstream Holdings and Frontier Communications have benefited from short squeezes this year–and they’re not the only high-yielding names that could bring more pain to short sellers and gains to savvy investors. That being said, stocks that offer significantly higher yields that their peers also carry greater risks. To differentiate the value traps from the treasures, investors must understand all the factors that determine the sustainability of the company’s dividend; nothing destroys value more rapidly than a payout cut. Contrary to conventional wisdom, effective due diligence doesn’t involve checking up on one or two metrics each quarter. Numbers can deceive unless you consider them in the proper context. 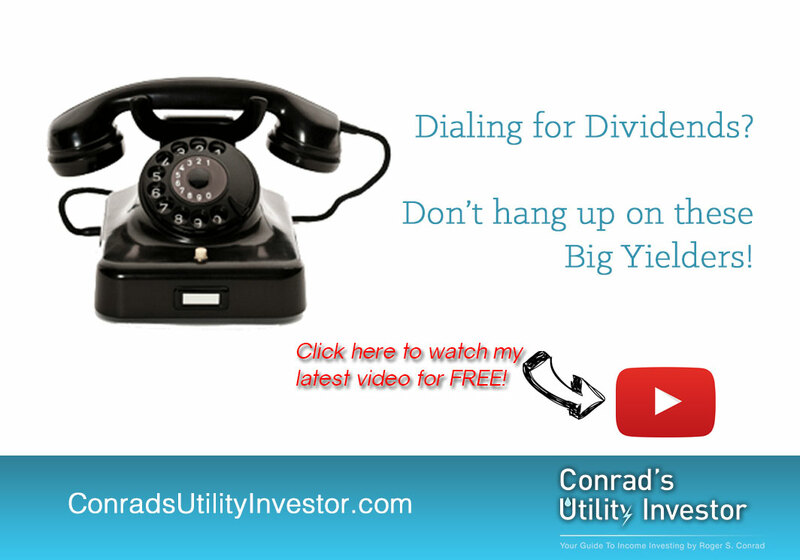 Take a company’s payout ratio, or dividend as a percentage of earnings. All else equal, lower payout ratios indicate greater dividend sustainability than higher payout ratios. The problem is all else never really is equal. For one, some business models generate far steadier revenue than others. A regulated utility, for example, will prove resilient in even the worst economic environment, while a technology firm may be pushed to the edge. Accordingly, utility can maintain a much higher payout ratio than the tech firm can over time. Debt is another great divider. A highly leveraged company may trip the thresholds on some of its loan covenants, forcing the firm to cut its payout even though the payout ratio appears safe. Bottom Line: Instead of worrying about interest rates, investors should focus on their holdings’ underlying growth prospects and assess potential risks to the dividend. It’s still a seller’s market for bonds. Case in Point: Enterprise Products Partners LP’s (NYSE: EPD) 7.034 percent bonds maturing Jan. 15, 2068, sport a yield-to-maturity of just 3.282 percent. Put another way, investors are willing to accept an annual return of less than 3.3 percent to buy this blue-chip MLP’s BBB- rated debt, which won’t mature for more than 53 years. These rock-bottom corporate borrowing rates enable companies to cut strengthen their balance sheets by terming out debt and financing growth projects and acquisitions. In fact, low financing costs have increased even the profitability of exceptionally low risk ventures. That’s great for company earnings and, by extension, stock returns. However, prevailing market conditions are far less sanguine for fixed-income investors. With few exceptions, income-seeking investors shouldn’t look to add to their bond holdings.